DECEASED: The late Matt Kivlehan from Holborn Street in Sligo. 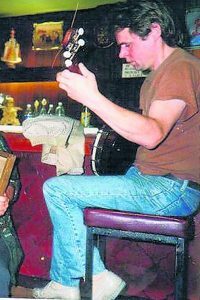 A man accused of murdering a musician told gardai he “never murdered anyone” when arrested on suspicion of the crime, the Central Criminal Court has heard. Keith Brady of Cartron Estate in Sligo is charged with murdering Martin Kivlehan on a date unknown between August 2 and 3, 2015 at Mr Kivlehan’s home in The New Apartments on Holborn Street in the town. He has pleaded not guilty to murdering the 59-year-old, but guilty to his manslaughter. His plea was not accepted by the State. Detective Sergeant Patrick Harney of Sligo Garda Station today (FRI) told prosecuting counsel Paul Murray SC that he arrested the accused on August 3, 2015 at 10.45pm. The trial continues this afternoon in front of Justice Carmel Stewart and a jury of eight men and four women.